The Thredz Show has all aspects of the fashion industry and price points in one convenient location. 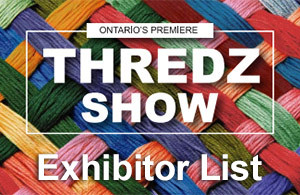 The Thredz Show will always have your favourites and new collections in the finest Women's and Men's apparel, accessories and footwear from Canadian and International Collections. The Sketch café at the Toronto Congress Centre offers award winning variety of meals, in a relaxed dining area located in Hall D. The Thredz Show is within close walking distance to major hotels and several restaurants. Retailer’s Pre-Registration – if you don’t Pre-Register for the show, please bring a copy of your business license when you attend the show. Don't miss the opportunity to participate in the Thredz Show! Provides a strong retail base. Connect with new and established buyers. Build your brand and increase your sales. Exhibit in a state-of-the-art facility. Centrally located to several hotels and restaurants. Thredz has sewn together all aspects of the fashion industry in one convenient location. All of your favorite representatives and brands presenting the finest in; Women's and Men's Apparel, Accessories and Footwear, from Canadian and International collections. Retailers can easily browse and research the largest array of fashion collections. Dedicated appointments may be pre-booked for your convenience. © 2019 Thredzshow.com, Inc. All rights reserved.